Coronaviruses are viruses in the family Coronaviridae. They are enveloped viruses with a positive-sense RNA genome. They have a nucleocapsid of helical symmetry. The genome size of coronaviruses are about 26 to 32 kilobases, extraordinarily large for an RNA virus. The name "coronavirus" is derived from the Latin corona, meaning crown or halo, and refers to how virions look under electron microscopy (E.M.). They have a fringe of large, bulbous surface projections looking like a crown. This morphology is created by the viral spike (S) peplomers, which are proteins on the surface of the virus. They decide which cells the virus can infect. Proteins that contribute to the structure of coronaviruses are the spike (S), envelope (E), membrane (M) and nucleocapsid (N). Coronaviruses infect the upper respiratory and gastrointestinal tracts of mammals and birds. Six different strains of coronaviruses infect humans. Coronaviruses are believed to cause many common colds in human adults. The significance and economic impact of coronaviruses is hard to assess. 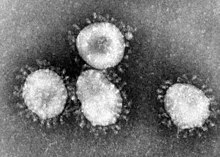 Unlike rhinoviruses (another common cold virus), human coronaviruses are difficult to grow in the laboratory. ↑ International Committee on Taxonomy of Viruses. "ICTV Master Species List 2009 – v10" (xls). ↑ enveloped = has viral envelopes covering their protective protein capsids; positive sense = the RNA sequence may be directly translated into the desired viral proteins. ↑ virion = complete virus particle. This page was last changed on 12 October 2018, at 17:47.